If you’re a sports fan, then you probably know plenty of fun facts about your favorite game. World records, player rankings, famous statistics. But let’s not forget about a very important part of the game: the sports equipment. Do you know any fun facts about that? 1. Shin guards date back to the Ancient Greeks and Romans. Today, we use shin guards in many different sports to protect (obviously) our shins from injury. But this piece of sports gear was in use thousands of years ago by the Ancient Greeks and Romans. At that time, shin guards were made from bronze (or another hard metal) and were worn for protection during battle. It wasn’t until the 19th century that the purpose of shin guards shifted from battle gear to sporting equipment. 2. Golf balls were once made of leather and feathers. Of all sporting equipment, the golf ball has arguably undergone the biggest changes. In the 19th century, golf balls also went by the name of “feathery” or “featherie” ball. This contraption was a hand-sewn, round, leather pouch stuffed with chicken or goose feathers and painted white. However, a “feathery” was both difficult and expensive to make. Feathers had to be boiled and softened before they were stuffed into the leather pouch. It was a challenge to make the leather pouch perfectly round, and it sometimes would split open upon impact. Nonetheless, the “feathery” ball remained the standard in practice for many years until the introduction of synthetic materials. 3. Athletic shoes make up 20% of all shoe sales in the U.S.
Boots, sandals, high heels. The shoe market is densely saturated with variety and choice. So, where do sneakers fall in the line-up? Athletic shoes account for 20% of all shoe sales in the U.S. When it comes to sporty footwear, Nike, Adidas, and Under Armor are the dominating brands. But, if you’re speaking specifically about sneakers, Nike is the reigning champion, claiming 90% of all basketball sneaker sales. 4. The first yellow tennis ball was used at Wimbledon in 1986. Ever wonder why tennis balls are yellow? The answer is quite simple: this vibrant color makes the ball easier to see. It was Wimbledon that made this fluorescent yellow the new standard for tennis. Since 1877, the Wimbledon Championship had used original, white tennis balls for play. However, in 1986, in order to make the balls more easily visible on television, players used yellow balls for the first time at this British tournament. 5. The average lifespan of a baseball is 7 pitches. The next time you play a game of baseball with your friends, think about the lifespan of that baseball. Just how long do you think that ball would last? According to experts in the field (no pun intended! ), the average lifespan of a baseball is just seven pitches. 6. Speedo’s LZR Racer swimsuit was banned from the Olympics in 2008. Speedo’s LZR Racer was a line of competition swimsuits released in February 2008. What was so special about this swimsuit design? The LZR Racer was created to allow for better oxygen flow to the muscles and to help hold the body in a more hydrodynamic position. In the 2008 Olympics, 23 swimming records were broken – and 98% of the medal winners were wearing this Speedo suit. Of course, controversy broke out. Was this suit really helping athletes break records? Opinions were mixed, but by the end of the year FINA (the International Swimming Federation) banned all body length swimsuits (including Speedo’s LZR Racer suit) from the Olympics. 7. Adidas spent 2 ½ years designing the soccer ball for the 2014 World Cup. For soccer fans, the 2014 World Cup was a big moment during the summer. But for Adidas, the excitement started over two years before. The sports company spend 2 ½ years designing and testing the ball for the big competition in Brazil. The final design, featuring a brightly colored ribbon pattern, represented the traditional, multi-colored bracelets worn in Brazil. Processes for testing this famous soccer ball involved more than 600 of the world’s best players, across 30 teams and in 10 countries. In fact, this ball was the most-tested EVER by Adidas as the ultimate goal was to create a soccer ball suitable for any possible condition. 8. A Spalding basketball has a lifespan of 10,000 bounces. A Spalding basketball is made of a synthetic rubber and leather material. So, just how long can this piece of sports equipment last? The average lifespan of a Spalding basketball is 10,000 bounces. That means that, for recreational use, a basketball should last between 4-5 years. Now, the question is: just how many games can you play within 10,000 bounces? 9. The strings on tennis rackets used to be made with sheep intestines. When tennis rackets were first developed, sheep or goat intestines were used for the strings. Although it may sound a little gross, these materials were actually ideal for stringing rackets because of their soft, yet resilient nature. In fact, sheep and goat intestines have much better tension than most comparative materials. This means that the strings could be strung tightly in order to improve ball control and return power, without increasing shock impact. Of course, tennis rackets are now strung with a synthetic fiber, usually nylon. Next time you’re out in the field pitching a baseball or hitting a golf ball, think of these fun facts. 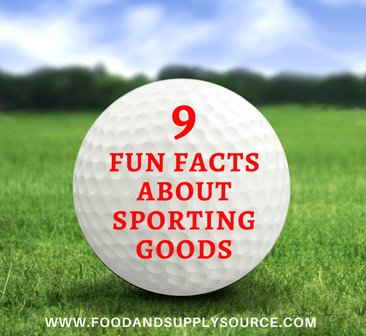 But, before you get to the field, you’ll need to stock up on sporting equipment. Food & Supply Source members save money every day on food, janitorial, educational supplies and much more. It’s free to become a member and you’re never locked in. Interested in finding out how much you can save? Request a Free Cost Analysis Today! To learn more, visit our website www.foodandsupplysource.com or you can Contact Us by email info@foodandsupplysource.com & phone 866-248-4520 – we’re here to help!